High Point’s Spring Market is a wrap! As always, it never dissapoints — and we’re back in the studio with inspiration overload and happily unpacking our market finds, soon to find their way into gorgeous client spaces we’re busy designing!! Here’s a glimpse into the High Point showrooms and a handful of trends we were crushing on all weekend long! A favorite stand-out from Market is texture on texture on texture on texture! 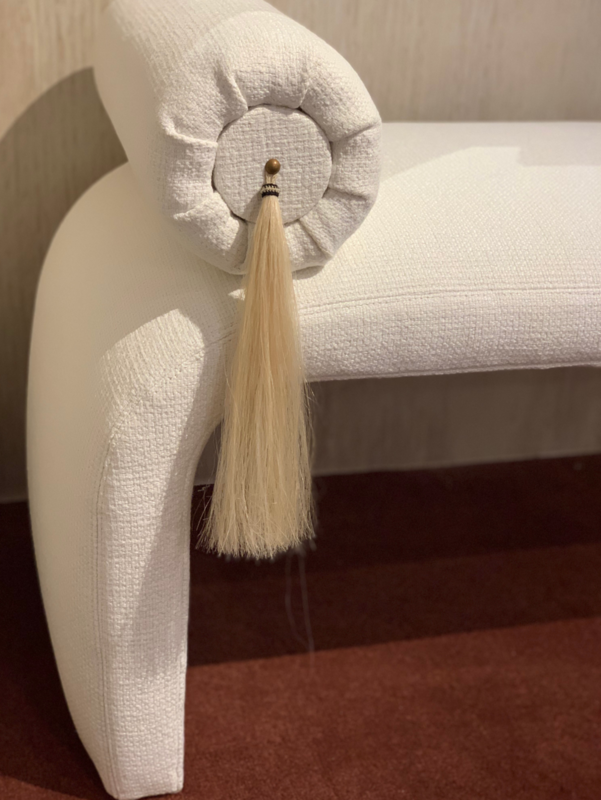 We saw upholstery with gorgeous texture, textured light fixtures, textured and layered rugs, decor accessories and more. We LOVE layering spaces with texture and personality, and here’s a few of our favorite (and textured) shots. Like last market, we saw upholstery with gorgeous curves everywhere! These rounded pieces provide immediate visual interest. We saw curved headboards, curved sofa backs — and (pictured here) most often, curved edges in the lines of chairs! We have no complaints here — black walls were in almost every showroom — and we are huge fans! Black paint creates such a moody atmosphere and we were taken with the way it shows off the playfulness of these gorgeous pieces. There’s a huge resurgence of caning in the design market, providing quirky and natural details to tables, chairs and end tables! We love the raw feel of these pieces and the organic tone. 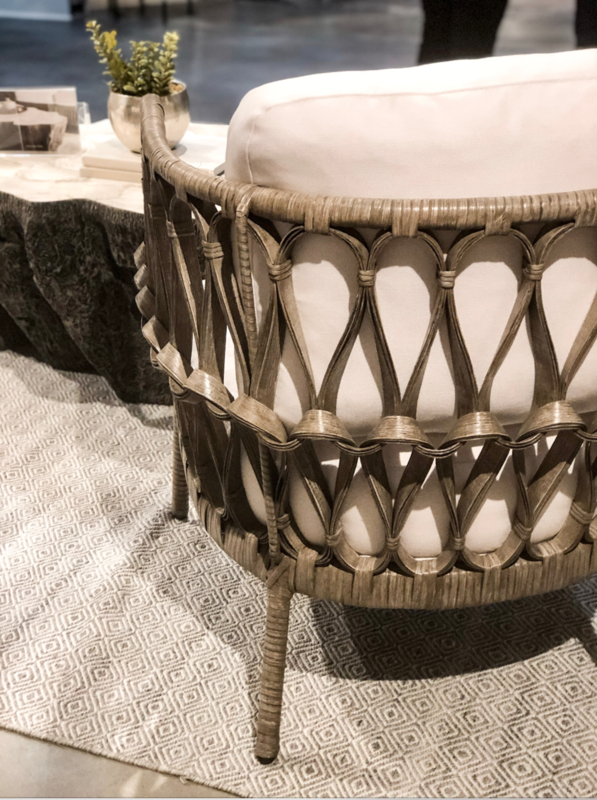 We were thrilled to see that rattan (even in BLACK!) is here to stay! Pink, blush and pale rose were constants in High Point. Not only in gorgeous velvet upholstery and in painted nooks but in wallpaper and our favorite — vintage rugs! We spent hours scouring rug vendors, searching for the perfect vintage, pink tones! Are you a fan or no? Check out our instagram stories for more highlights of this year’s market! It's FINALLY spring and it's motivating us to freshen up some spaces! Design is meant to be fun and some of our most memorable spaces to bring sunshine to this season have been kid rooms! Not only are our mini-clients charming as can be, but their reactions to their finished spaces stay with us forever! A favorite girl’s room we designed, Girly Boho, we designed for a 6-year-old girl in Mountain Island Lake. A wonderful, young family hired House of Nomad last spring, asking for personalized designs for their young daughter’s bedroom. From her room to yours, here’s a guide for how to create timeless and sophisticated kid paces! For this space, we found out that our client LOVED crafts and had always dreamed of a dedicated craft space. She also loved books and reading — and soft fabrics. We were TOTALLY taken with her charm and she was so excited to be part the creative process! 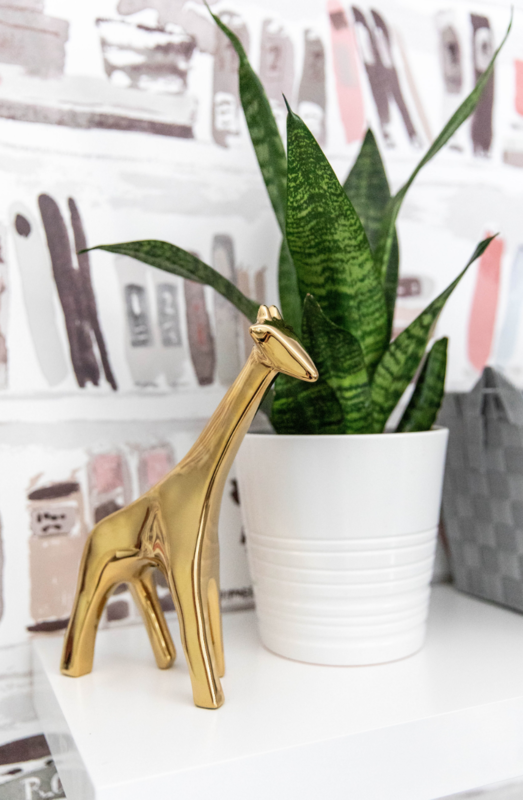 With every kid space we have designed, we’ve found that if we include these elements — it’s a no-fail road to creating playful rooms that grow up a bit with our little clients as the years go by. When thinking about a child’s space, TIMELESS is the word we say on repeat. With timeless in mind, our next step for this bedroom was to brainstorm how to combine the two lists. 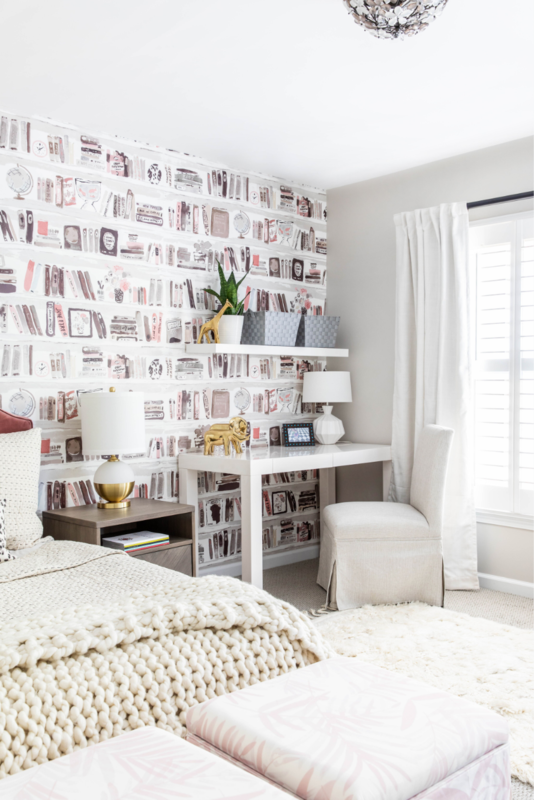 We always start the design process with a particular item as our launching point, so we took her love for books and the idea of an accent wall and combined the two with the find of this Kate Spade wallpaper. That jumpstarted the rest of the room and we moved on to bedding selection (solid bedding and headboard to break up the bold wallpaper). Next, we created a desk area with dedicated craft bins and a reading nook with the coziest chair. Go for twin beds (or larger), not bunkbeds — they are more versatile and create a grown-up feel that the child can grow into. Themed rooms are tough on the timeless department. If a child is obsessed with a certain character/sport/etc., consider incorporating this passion into the art or an accent piece. A large print can be easily swapped out as tastes change, but also provides the personal touch that makes the kid own the space. 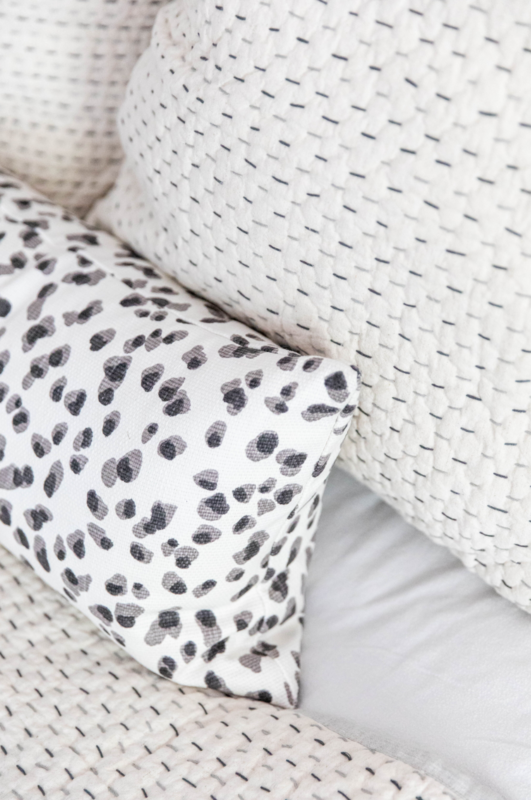 Pick solid colors for bedding and headboard/footboard, and bring in fun patterns in with blankets and throw pillows. Even in spaces for younger people, incorporate greenery. It provides a calm and natural feel to the space — even if its faux. While we are NOT fans of faux, we do think kid spaces are an exception. 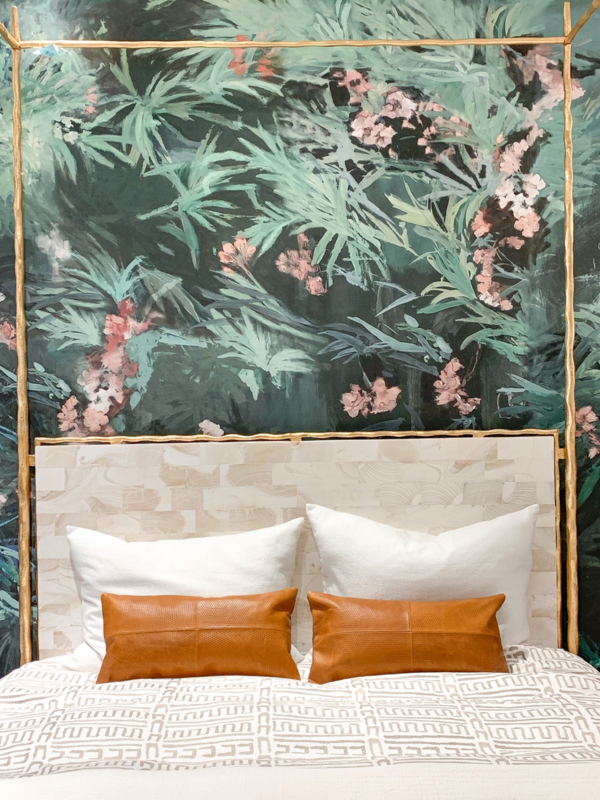 For this bedroom — we let our mini-client be the final call on fabrics and finishes. She picked the wallpaper, the custom chair fabric, the ottoman upholstery and the headboard hue. Design is always sensory, so we gathered a tray (picture above) of samples and let her feel the fabrics and look at them together as she made her picks. 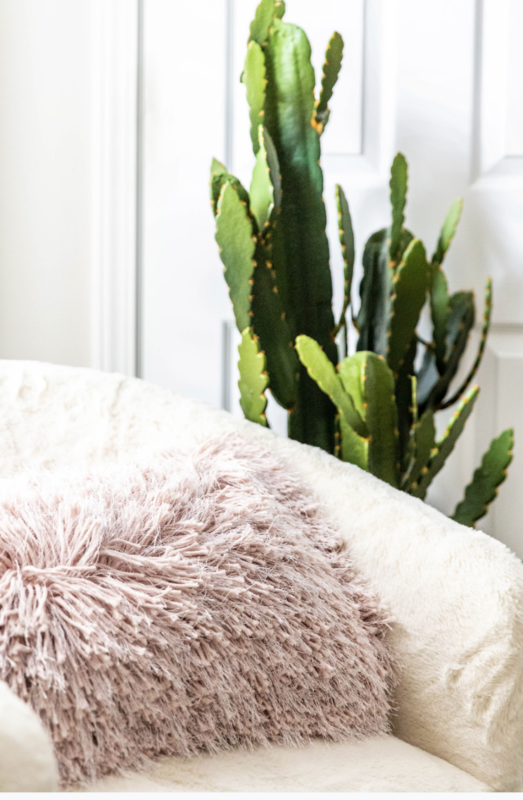 With her help, HON brought in playful texture with the pink-palm fabric, chunky throw blanket and patterned lumbar — and a pop of green in the mini-snake plant and giant faux cactus. Design Tip: Make sure all the options you offer are all a win together! But do keep an open mind, this is the little’s personal space. Eclectic — within reason — can be charming, too. 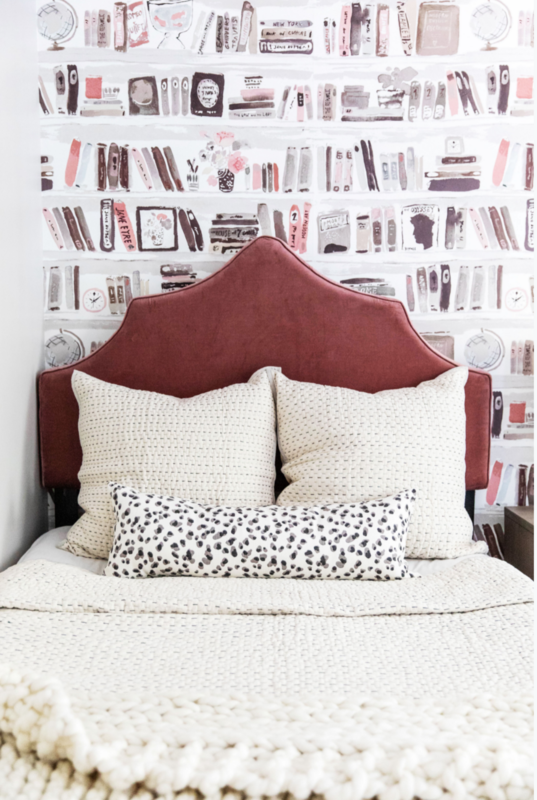 A HON favorite from the space is of course the Kate Spade wallpaper, which reflects her love of reading — and the playful mix of feminine fabrics and the bold cheetah print. The custom ottomans provided storage and a fun pop. Another HON favorite from this space is the Regina Andrew flushmount, which added finished the space. 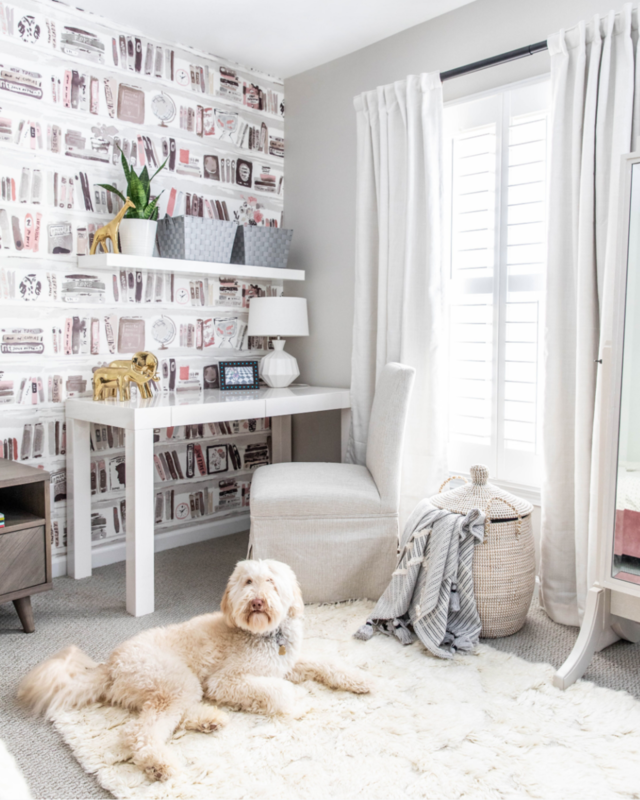 The full reveal was everything we dreamed of — she SCREAMED with delight when she her room, and ran from her craft area to her reading nook, pointing and picking up every detail with so much delight, it was contagious! We won’t ever forget the look on her face!! This project was incredibly fulfilling for House of Nomad, crafting a design and floor plan to represent the unique personalities of this client (no matter how old!). 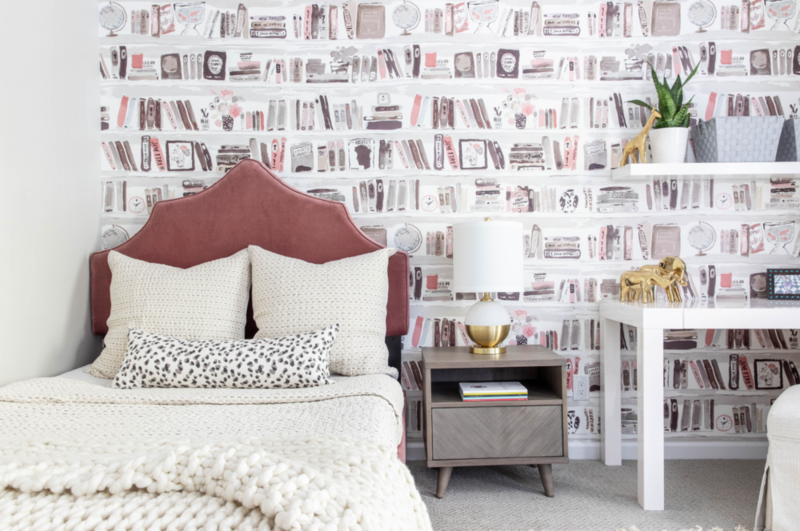 Her room is stylish with the accent wall, functional with crafting and reading areas — and all around beautifully cozy. All photos taken by our lovely Laura Sumrak.